Airline stocks are continuing their gains as they cheer the drop in jet fuel prices. US Airways (LCC) shares jumped some 20% in the past five trading sessions, while Delta Air Lines (DAL) gained about 13%, United Continental (UAL) 11%, Southwest (LUV) 7%, and Alaska Airlines (ALK) about 5%. Jet fuel prices fell to $2.92 a gallon on May 23, a 14% drop from this year's high of $3.39 a gallon on February 24. 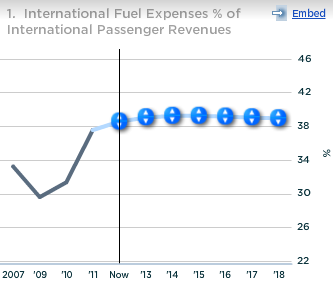 If fuel prices stay at current levels, their estimate of $3.19 per gallon by the International Air Transport Association for this year would need serious revision. Below we present our analysis on the magnitude of savings that the airlines can realize through this fall. According to the first quarter statistics shared by Bureau of Transportation Statistics, the average fuel price stands at $3 per gallon. Should it remain the same the entire year, it would mean a 19 cent a gallon savings compared to the IATA estimates for 2012. Since airlines are expecting marginal capacity additions this year for which additional fuel requirements may get balanced by deployment of fuel efficient aircraft, we expect the overall fuel consumption to maintain levels close to 2011. In that case, an average fuel price of $3 a gallon can result in fuel cost savings worth $3 billion this year excluding hedging initiatives. Further, the magnitude of savings can expand further if fuel prices maintain current levels. The extent of appreciation in stock prices recently gives a fair estimate of the each carrier's share of these fuel benefits. 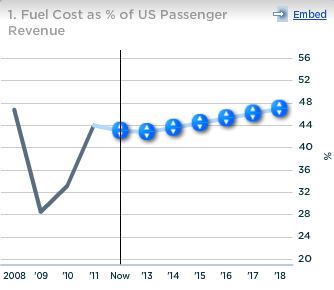 US airways has kept itself aloof from fuel hedging programs thereby resulting in substantial benefits for the carrier with every minor correction in the fuel price. United has hedged 36% of the expected fuel consumption for the second half of 2012 through various derivative contracts and expects fuel cost at $3.35 per gallon excluding hedges for 2012, or 43 cents above current market price. Alaska expects its fuel bill for this year to be impacted by $9.5 million with every cent/gallon of fuel. Fuel has been the prime factor driving the profitability of the airlines. IATA's revised global profit estimates from $3.5 billion to $3 billion for 2012 were also a result of fuel price headwind. Should fuel prices maintain lower levels, these cost benefits would directly reflect in the airlines' bottom-lines. BANGKOK (AP) -- World stock markets were pummeled Monday by election results in Greece and France that heightened uncertainty about Europe's ability to solve its debt crisis. Signs of a faltering economic recovery in the U.S. compounded the dour mood while oil slid to nearly $97 a barrel. Japan's Nikkei 225 index plunged 2.8 percent to close at 9,119.14 — its lowest finish in three months — with the market's export sector also sapped by a rising yen. Hong Kong's Hang Seng slid 2.6 percent to 20,536.59. Futures augured losses for Wall Street. Dow Jones industrial futures fell 0.8 percent to 12,857 and S&P 500 futures lost 0.9 percent to 1,350.90. Among European markets, Germany's DAX dropped 1.5 percent to 6,463.67 and France's CAC-40 shed 1.6 percent to 3,112.49. Britain's markets were closed for a public holiday. Weekend election results in Greece sent tremors throughout Europe as voters punished the parties responsible for highly unpopular austerity measures instituted to prevent the country from defaulting on its massive debts and exiting the euro currency bloc. No political party won enough votes to form a government, raising the possibility of new elections within months and protracted uncertainty for global markets. Meanwhile, in France, President Nicolas Sarkozy lost to Socialist candidate Francois Hollande, who had criticized the country's austerity program and wants to boost government spending. Francis Lun, managing director of Lyncean Holdings in Hong Kong, said markets were overreacting to fears Hollande would make good on a campaign pledge to renegotiate an agreement signed by Sarkozy to put the brakes on government overspending. "Even though Hollande indicated he will repudiate Sarkozy's agreement with the European Union, in reality he cannot do it," Lun said. "It is understood that a new government cannot repudiate or renegotiate a treaty signed by the previous government." Yet much could depend on French parliamentary elections next month. If there is a continued backlash against austerity policies, Hollande would face additional pressure to boost spending sharply. That could lead to further downgrades of France's credit rating and kick off a fresh wave of crisis fears, destabilizing global markets. In other Asia markets, Australia's S&P/ASX 200 lost 2.2 percent to 4,301.30 and South Korea's Kospi shed 1.6 percent to 1,956.44. On Friday, U.S. stocks plunged after the government reported that hiring slowed sharply in April. A report from the Labor Department Friday showing that U.S. jobs growth slumped in April for a second straight month. The 115,000 jobs added in April and the 154,000 in March were down form an average of 252,000 a month from December through February. Energy stocks were among the hardest hit after the price of oil lost about 8 percent over three trading days. Hong Kong-listed China National Offshore Oil Corp., or CNOOC, tumbled 4.8 percent. Japanese energy explorer Inpex Corp. lost 5.3 percent. South Korea's S-Oil Corp. fell 4.4 percent. Financial shares sank amid all the uncertainty. Japan's Nomura Holdings Inc. plunged 7.4 percent while ICICI Bank Ltd., India's largest private lender, lost 1.9 percent. Hong Kong-listed Bank of China Ltd. lost 2.6 percent. Australian resources stocks also fell sharply. BHP Billiton, the world's No. 1 mining company, dropped 4.1 percent. Uranium miner Energy Resources of Australia sank 7.4 percent and its rival, Paladin Energy Ltd., dived 6.8 percent. Major Japanese exporters deteriorated as the yen strengthened. Yamaha Motor Corp. toppled 6.8 percent while Honda Motor Corp. fell 5.6 percent. Sony Corp. lost 4.5 percent. Benchmark oil for June delivery was down $1.18 to $97.31 a barrel in electronic trading on the New York Mercantile Exchange. The contract fell $4.05 to settle at $98.49 in New York on Friday. In currencies, the euro fell to $1.3017 from $1.3089 late Friday in New York. The dollar fell to 79.83 from 79.87 yen. NEW YORK, May 30 (Reuters) - U.S. stocks dropped on Wednesday, as rising bond yields for Italy and Spain and the latest poll results in Greece worsened fears about a spiraling of the euro zone's debt crisis. The region's fiscal woes sent the yield on the safe-haven 10-year U.S. Treasury note to the lowest in 60 years and the euro to its lowest level in 23 months against the dollar. U.S. equities have been closely tethered to the currency's fortunes, with a 50-day correlation between the euro and the S&P 500 index at 0.91. "The longer they (Europeans) drag it out, the less severe are the ramifications of a break-up and then who actually ends up exiting - so much of this is unwritten it is hard to put any sort of odds on how this plays out," said Nathan Snyder, portfolio manager at Snow Capital Management in Sewickley, Pennsylvania. Yields on 10-year Spanish bonds moved closer to the 7 percent level, a point at which other nations in the bloc were forced to seek a bailout. Spain is expected to issue new bonds shortly in an effort to fund its troubled banks despite the increased borrowing costs. Adding to the concern, Italian 10-year yields topped 6 percent for the first time since January at a bond sale, raising concerns the region is vulnerable to a contagion. Investors were given cause for optimism after the European Commission said the the euro zone should move toward a banking union, consider eurobonds and the direct recapitalization of banks from its permanent bailout fund as well as boost growth and cut debt. But the cheering was short-lived after the latest poll from Greece showed the radical leftist SYRIZA party has taken the lead over the pro-bailout conservatives ahead of a national parliamentary election next month that may determine whether the debt-laden country stays in the euro zone. "It seems inevitable the euro has got to break up, it's just how long can they drag it out and what are the ramifications," said Snyder of Snow Capital Management. The CBOE Volatility index jumped more than 10 percent, it's biggest spike since mid-April. The PHLX oil service sector dropped 2.9 percent with U.S. crude down more than 2 percent as the euro zone's debt problems and signs China was not planning a large stimulus package stoking demand fears. National Oilwell Varco Inc lost 2.6 percent to $68.19. European shares were buffeted by the conflicting headlines, with the latest Greek poll pushing the FTSEurofirst 300 index down more than 1 percent. The Dow Jones industrial average dropped 135.21 points, or 1.07 percent, to 12,445.48. The Standard & Poor's 500 Index lost 16.32 points, or 1.22 percent, to 1,316.10. The Nasdaq Composite Index slumped 40.97 points, or 1.43 percent, to 2,830.02. U.S. economic data showed contracts to purchase previously owned U.S. homes unexpectedly fell 5.5 percent in April to a four-month low, dealing a blow to more recent optimism the housing sector may have hit a bottom. Research In Motion Ltd tumbled 10.6 percent to $10.05 as the biggest percentage decliner on the Nasdaq 100 index. The company hired bankers for a far-reaching strategic review and to look for partnerships as the BlackBerry-maker warned it would likely report a shock fiscal first-quarter operating loss. Apple Inc slipped 0.9 percent to $567.14 after Chief Executive Tim Cook, speaking at the All Things Digital conference said technology for televisions was of "intense interest" but stressed the company's efforts would unfold gradually amid speculation the iPad and iPhone maker was on the brink of unveiling a revolutionary iTV. Macy's Inc reported better than expected May same-store sales on Wednesday, helped by its growing e-commerce business. Shares slipped 2.9 percent to $37.86. Pep Boys-Manny, Moe & Jack plunged 21.7 percent to $8.68 in premarket after the automotive parts and service chain said the sale of the company to private equity firm Gores Group has been called off. Stocks finished sharply lower Wednesday, wiping out all of the previous session's gains, as growing worries over rising bond yields in Spain and Italy and fears over Greece's possible euro zone exit kept investors on edge. Facebook [FB Loading... () ] took another leg lower, with the stock finishing near $28 a share. The stock has plunged nearly 25 percent since its market debut almost two weeks ago. The social-networking giant received notice that U.S. antitrust regulators will give its proposed purchase of Instagram a lengthy investigation. The Dow Jones Industrial Average tumbled 160.83 points, or 1.28 percent, to close at 12,419.86, led by Alcoa [AA Loading... () ] and BofA [BAC Loading... () ]. The blue-chip index is less than 2 percent from erasing all of this year's gains. The S&P 500 fell 19.10 points, or 1.43 percent, to end at 1,313.32. The Nasdaq dropped 33.63 points, or 1.17 percent, to finish at 2,837.36. The CBOE Volatility Index, widely considered the best gauge of fear in the market, surged nearly 15 percent to finish above 24. All 10 S&P sectors closed lower, led by energy and financials. Non-farm payrolls are expected to show a gain of 150,000 in May, according to a Reuters poll, after a small gain of 115,000 new jobs in April, the fewest in six months. On the economic front, pending home sales dropped 5.5. percent in April to a four-month low, according to the National Association of Realtors. Economists polled by Reuters had expected a gain of 0.1 percent, after a previously reported 4.1 percent gain. European shares finished sharply lower and the euro touched a 23-month low against the U.S. greenback as investors worried that Spain's banking problems would push its borrowing costs near highs not seen since last November. And worries over Italy's borrowing costs also raised alarm, pushing the Italian 10-year bond above 6 percent. Apple [AAPL Loading... () ] CEO Tim Cook said technology for televisions was of "intense interest" but stressed the company's efforts would unfold gradually, amid speculation the iPad and iPhone maker was on the brink of unveiling a revolutionary iTV. Meanwhile, Research In Motion [RIMM Loading... () ] plunged almost 10 percent after the troubled BlackBerry maker said it hired bankers for a strategic review and to look for partnerships as the company warned it would likely report an operating loss in the first quarter. In addition, at least nine brokerages slashed their price target on the firm. Pep Boys [PEP Loading... () ] plunged after the automotive parts and service chain .n>said the sale of the company to private equity firm Gores Group had been canceled. Stanley Black & Decker [SWK Loading... () ] is among potential bidders for private equity-owned Infastech, a Singapore-based industrial fastener maker with revenues of more than $500 million, sources with direct knowledge of the matter said. Wynn [WYNN Loading... () ] shares rose after Goldman Sachs upgraded the gaming resort company from "neutral" to "buy." Also on the economic front, mortgage applications fell last week even as rates hit another record low, according to the Mortgage Bankers Association. YOU might think that competition law only applies to large business and does not affect your business. But you might be wrong. Whenever your business deals with its competitors, there are competition law issues that you need to consider. Competition law applies to all companies and is designed to ensure that companies compete fairly with each other. Failure to comply can have serious implications for your business, including large fines. Certain serious breaches of competition law may also expose an individual to the risk of criminal prosecution. Businesses can also be exposed to claims that may exceed any fines imposed on them. n Price fixing. Any understanding or agreement about price levels or increases can constitute price fixing. Even a statement to a competitor like “we intend to increase prices next year”, can constitute unlawful price fixing. n Bid rigging. This is when companies agree the outcome of a tender or pitch process amongst themselves. Bid-rigging eliminates fair competition from the process, removes the customer’s free choice and will almost certainly lead to the customer paying higher prices. n Market sharing. This may involve an agreement to allocate particular customers or sales territories to individual cartel members. Your business must not agree to share confidential or commercially sensitive information with competitors such as prices, customers or sales information. Some forms of information exchange may be permissible, for example if the information provided has no value in predicting future commercial behaviour, or is anonymised, aggregated, etc. Sales or production quotas are often used to control the market position of cartel participants and maintain artificially high prices. To be safe, always take legal advice before any co-operation with competitors that may reduce competition and breach competition law. Competition law is easy to fall foul of. If you become aware that your business is involved in any cartel activity, or you are approached by a competitor to participate, you should take legal advice immediately. (RTTNews) - With traders expressing renewed concerns about the financial situation in Europe, stocks have moved sharply lower in early trading on Wednesday. The major averages have shown notable moves back to the downside after ending the previous session firmly in positive territory. The major averages have edged up off their lows in the past few minutes but continue to post steep losses. The Dow is down 124.42 points or 1 percent at 12,456.27, the Nasdaq is down 37.93 points or 1.3 percent at 2,833.06 and the S&P 500 is down 14.89 points or 1.1 percent at 1,317.53. The early weakness on Wall Street reflects worries about the impact of rising Italian and Spanish bond yields as well as the results of a new poll showing the anti-bailout Syriza party in the lead in next month's elections in Greece. Disappointing guidance from Research in Motion (RIMM) has also generated some negative sentiment, with the Blackberry maker saying it now expects to report an operating loss for its first quarter. The company attributed the forecast of a loss to the competitive environment. Oil service stocks have shown a substantial downward move in early trading, moving lower along with the price of crude oil. With crude for July delivery tumbling $1.95 to $88.81 a barrel, the Philadelphia Oil Service Index is falling by 3 percent. Significant weakness has also emerged among steel stocks, which helped to lead the markets higher in the previous session. Networking, natural gas, and housing stocks have also pulled back sharply after posting strong gains on Tuesday. Most of the other major sectors have also come under pressure in early trading, reflecting broad based weakness in the markets. In overseas trading, stock markets across the Asia-Pacific region moved mostly lower during trading on Wednesday. Japan's Nikkei 225 Index ended the day down by 0.3 percent, while Hong Kong's Hang Seng Index plummeted by 1.9 percent. The major European markets have also shown notable moves to the downside on the day. The German DAX Index is down by 1.3 percent, while the U.K.'s FTSE 100 Index and the French CAC 40 Index are down by 1.6 percent and 1.8 percent, respectively. In the bond market, treasuries have moved sharply higher amid the renewed worries about Europe. As a result, the yield on the benchmark ten-year note, which moves opposite of its price, has plunged 7.8 basis points to a record low of 1.653 percent. LONDON, May 30 (Reuters) - Bets that the ECB will cut interest rates next week are again appearing in money markets, as Spanish and Italian debt yields are approaching levels that made the central bank introduce unprecedented easing measures last year. The threat that Greece could eventually leave the euro and worries over Spain's banking sector have prompted investors to sell Spanish and Italian debt, bringing the two countries' borrowing costs closer to levels deemed as unsustainable. The sheer size of their debt markets and their deep-rooted connections with other financial systems in the euro zone are reasons for investors to speculate that a policy response is in the works. The European Central Bank is, as usual, seen as the most likely institution to take measures to cool market nerves because it can act faster than politicians. It has done it before in the past by injecting around 1 trillion euros of cheap loans into financial system in December and February. Euro zone economic data this month has also been poor, supporting bets that the ECB may soon resume monetary easing, possibly by cutting its key refinancing rate by 25 basis points from a record low of 1 percent. "Data ... have been softer, and then you have the Greece issue continuing to be unresolved and the Spanish issue continuing to be unresolved," said Elaine Lin, a rate strategist at Morgan Stanley, whose economists predict a rate cut. She said the euro overnight Eonia rate forward market was only pricing an over 10 percent probability of a rate cut in June and the chances were higher by another 10-20 percentage points for the July meeting. However, she expected markets to factor in a higher probability in the next few days. A key rate cut, if also accompanied by a cut in the 25 basis points deposit facility rate, could trigger a 5-10 bps fall in the near-term forward Eonia rates towards the 20 bps level seen now in September-October Eonia forward rates, Lin said. The lowest point on the 2012 Eonia curve is December, at 16 basis points, which implies an 80 percent probability that the deposit rate would be slashed in half, according to BNP Paribas rate strategist Matteo Regesta. A Reuters poll of economists showed the ECB was likely to resist pressure to cut interest rates in June, but also pointed to a growing probability that it will reduce them later this year. Speculation about ECB monetary easing has also been fuelling a rally in Euribor futures , implying bets for lower fixings of benchmark euro zone interbank three-month Euribor rates later this year. The December Euribor future has gained back most of its losses made since Greece's inconclusive election on May 6, which sparked fears the country may be on its way out of the bloc. The fall earlier this month also coincided with unwinding bets that the ECB would have cut rates in May. The contract was last 3.5 ticks higher on the day at 99.46. That was one tick lower than the pre-election close on May 4, but some 15 ticks higher from the lows hit in mid-May. The move higher in Euribor futures, which has been faster than the move lower seen in the very low Eonia forward rates, has led to tighter Euribor/Eonia spreads, which are widely used as a gauge of money market stress. That is counter to what is happening in banking credit default swap markets - where investors can insure against banking defaults. The Markit iTraxx index of European senior financials CDS remains close to its highest level this year at around 300 bps. BNP Paribas' Regesta warned that Euribor futures could fall again as they have done after the ECB's May meeting and this would trigger a widening of the Euribor/Eonia spreads consistent with the levels of stress felt in money markets. "You have a decoupling between those spreads and the banks CDS now, but those spreads remain exposed to significant paying interest in coming weeks ... unless there is another policy response from the ECB at its meeting next week," Regesta said.